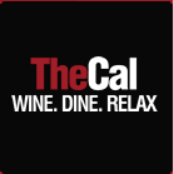 Located in the heart of town within walking distance to the shopping precinct and only a stone’s throw from the train station The Cal is one of the most popular spots in town to stay because of it’s location. 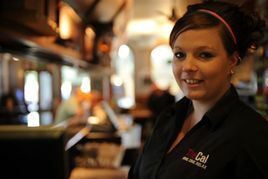 We are also known for our delicious meals served in our Bistro – so be sure to stop by and see for yourself. 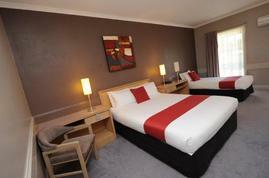 Our large 4 Star Modern rooms are perfect for families, business people and travellers alike. 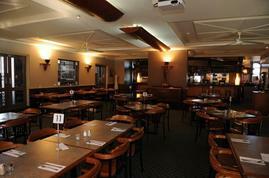 We have fourteen rooms and can cater for larger groups as well. Parking is at your door and free of charge. A Beer Garden separates our Bistro from the accommodation so you can be guaranteed of a peaceful night’s rest. Our Bistro, Bar and TAB are metres away so you can wine, dine and then relax in one of our beautiful rooms. Not to mention our function room if you are trying to organise a party, wedding or any special occasion.Our large Bistro is family friendly and offers a wide variety of dishes all at a 5 Star quality – but great value for money. We pride ourselves in buying produce locally and highly recommend you try our Wagyu Beef when dining with us next.